In this Jan. 29, 2017, photo, actress Samira Wiley (L) and writer Lauren Morelli attend The Weinstein Company & Netflix's 2017 SAG After Party in partnership with Absolut Elyx at Sunset Tower Hotel in West Hollywood, California. An actress and producer-writer from "Orange Is The New Black" have married. 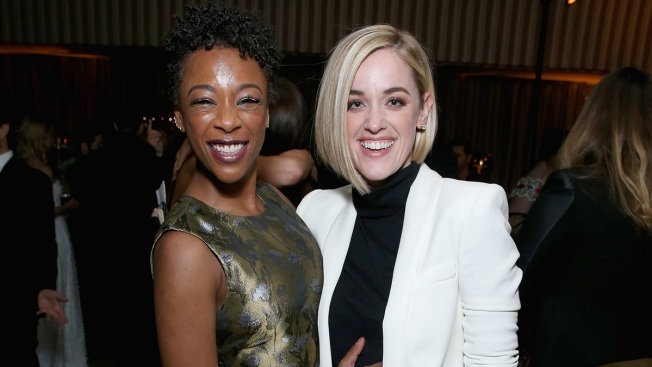 Actress Samira Wiley, who plays the character Poussey Washington on the Netflix show, and Lauren Morelli wed Saturday in Palm Springs, where they were engaged. Publicist Scott Boute says both women wore gowns designed by Christian Siriano. Wiley, 29, will also appear in the upcoming series "The Handmaid's Tale," based on the 1985 novel by Canadian author Margaret Atwood that depicts New England under a totalitarian theocracy. Morelli, 34, has worked as a writer, story editor and producer of "Orange Is the New Black," which depicts life inside a women's prison, since 2014. In May 2014, Morelli wrote an article titled "While Writing for 'Orange Is the New Black,' I Realized I Am Gay." She detailed how she questioned her own sexuality while working on the show. "I was so deep in my own self-doubt that I constantly felt like a fraud. I was sure it was bleeding into my writing," Morelli wrote about writing a love scene between the lead characters, and being married to a man. Now, it looks like Morelli and Wiley get to have a real-life happy ending.